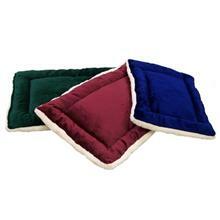 Select Size 16" X 21" 20" X 27" 22" X 32" 24" X 36" 27" X 40"
• Polyester lambskin on one side with plush on the other. • Inside is a soft polyester blend fiber filling so it's extra soft. • The entire bed can be machine washed again and again. Hunter Green, Burgundy, and Navy Blue.